It might be difficult to believe, but your baby is 6 months old now. Your baby is happy, social, and just a bundle of energy at this stage. Your baby communicates with you with much more clarity, and you know all the sounds and signs. Your baby has also gotten bigger and picked up a few new skills. Babies grow quite quickly during the first 6 months of life. This means, on average, your baby should be at double the birth weight by now. Of course, various factors like premature birth, birthweight, etc, come into the mix, but if all has been normal so far, then this is the weight you should expect of his growth. You may notice some changes in the physical features in your 6-Month Baby. The colour of the eyes will have set by now, which may be different from the birth shade. Your 6-Month Baby will be able to sit up. Babies start moving by rolling on the stomach, and back. They will then prop themselves up with their hands, and soon be able to sit up without support. Every baby is different. And they start to move differently as well. Some babies will crawl on their hands and feet. Some babies will push themselves with their tummies. Some babies will use their knees for support, while others will not. Some babies even use their buttocks to push themselves while in the sitting position. This is all perfectly normal. As long as you see the effort to move, which will eventually turn into walking, you need not to worry. All this increased physical activity will also mean that your 6-month baby needs more nourishment. You will have started some solid foods by now, and your baby will be testing and developing the taste buds for different flavours and textures. If your baby does not like something, try again after a few days. Babies can be very fickle, and can easily change their minds about what they like and don’t like, so try lots of different foods. Sleep is an important activity at this time, as babies need to rest to aid their development. You will find that your baby sleeps through the night, giving you a good eight-hour rest period. Your baby will even move around when sleeping, so don’t be surprised to find your baby in a different position in the morning, much like adults. This is a beautiful age, where your 6-month baby will smile, laugh, and babble to himself. He will try to repeat your words, although they will come through as babble. You might even hear a “mama” in there sometime. This is a great time to introduce books and storytelling, and it will help him develop his language and communication skills. Increased awareness of his surroundings means that your baby knows who you are, and who his family is. He will start to become wary of strangers and unfamiliar faces, and you may find him crying if he is held by someone new. Some babies are more social than others though and can love meeting new people and ‘talking’ to them. If shown love, they respond very well and happily go to or play with adults. This is like a sneak peek into your baby’s personality in a way, and you should encourage more positive behaviour so he improves communication skills. 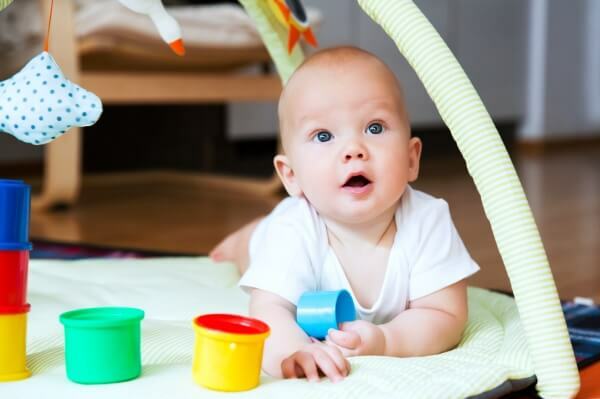 All babies develop at their own pace, and they may not display the same skills at the same time. Generally, 6-month-old babies should be able to make sounds, sit without support, and smile and make eye contact by this age. You can check these skills by playing games with your baby, like peek-a-boo, which will help gauge his reactions. Another good activity to encourage your baby to move is to place his favourite toy just out of reach, so he pushes his body towards it. Make sure the toys are age-appropriate, as he will most likely put it straight into his mouth.